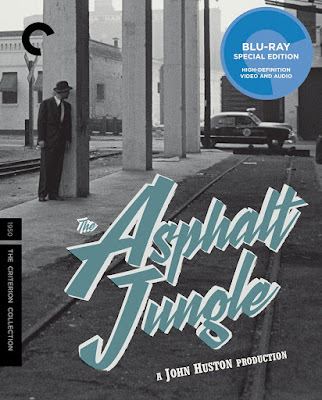 Rupert Pupkin Speaks: Criterion Collection - THE ASPHALT JUNGLE on Blu-ray ""
Prior to my exposure to RESERVOIR DOGS, my heist movie expertise was limited to movies like THE GREAT MUPPET CAPER and the then new, but now forgotten Kim Basinger vehicle THE REAL MCCOY. It wasn't until after RESERVOIR DOGS that I started to look into the films that may have preceded and influenced Tarantino. Two that I often heard mentioned in the same breath were Stanley Kubrick's THE KILLING (also on Blu-ray from Criterion) and John Huston's THE ASPHALT JUNGLE. Both films were seen as some of the early classic examples of the heist genre. 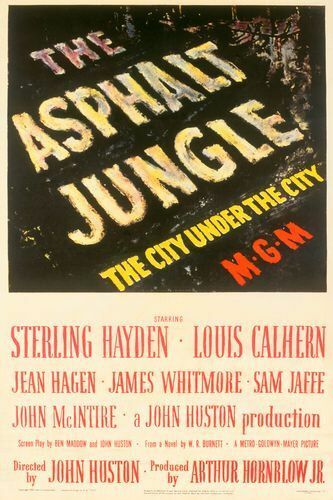 Both films also starred Sterling Hayden, who I sadly also wasn't really aware of at the time (and who has since become a personal favorite). Since Tarantino had clearly seen tons of these movies in his video store days and prior, I made it my mission to track down as many as I could. 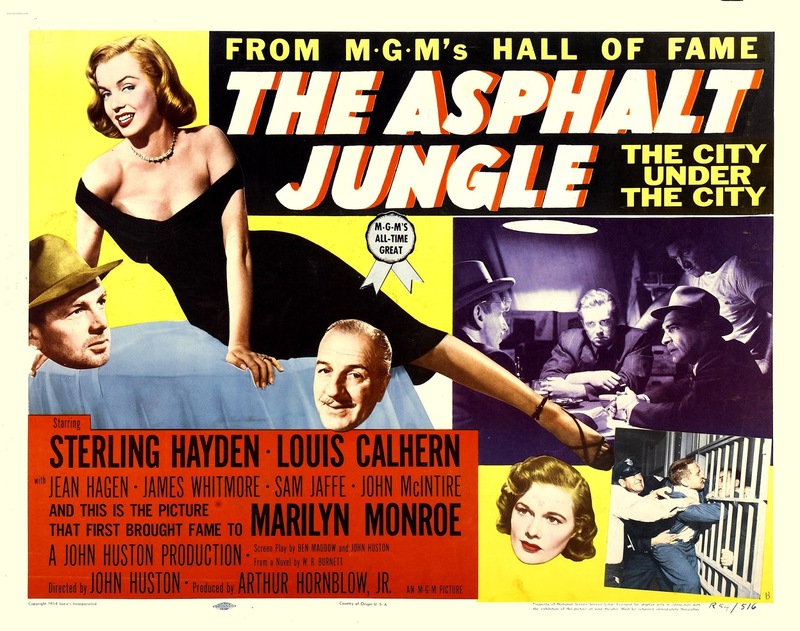 Both THE KILLING and THE ASPHALT JUNGLE were a couple of the first few that I sought out. I wasn't fully connecting with the idea of going through director's filmographies back then and had only done that a little with Scorsese and maybe Billy Wilder. 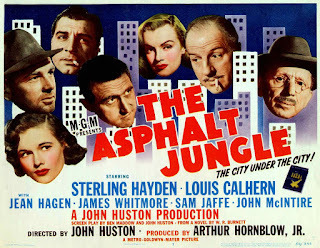 I had seen THE MALTESE FALCON, but I only put the two and two together that John Huston had directed that movie and THE ASPHALT JUNGLE just as I came across the film for the first time. This was all pre-internet mind you, so the best way to see what other films a director had done was by using the huge catalog guide books that Blockbuster Video stores used to have. I'd flip open one of the director pages and start jotting down notes. Then, inevitably, I'd end up having to go to several video stores to scoop up any of the titles that were even available on VHS. So naturally my video store didn't carry THE ASPHALT JUNGLE and I had to rent it elsewhere. I had already seen THE KILLING and liked that one quite a bit so ASPHALT already had a higher bar set for it. When I finally found the VHS and watched it, I liked it, but not as much as THE KILLING. 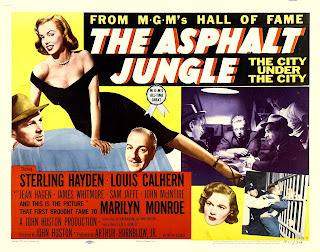 As detached as Kubrick can be with his characters, ASPHALT felt even more distant and cold. At the time that turned me off a little and I had trouble connecting with it, but not I see it more as Huston trying to reflect the sensibilities of the world he was portraying. The story deals with one crook getting funding for a diamond heist and how he goes about putting his gang together. The coldness that I must have interpreted from the characters that first time makes much more sense as being a natural part of the criminal underworld and the characters who inhabit it. Of course they are suspicious of each other and not necessarily jovial - they have to be. Trust and compassion are luxuries that these lawbreakers cannot afford. I'm reminded of Steve Buscemi's line as Mr. Pink in RESERVOIR DOGS when he says, "They get you, they get closer to me and that can't happen". It all makes sense that in a world of nefarious people, the only one you can truly rely on is yourself. I think that all just made the film seem more dry to me and somehow that translated to less engaging. Now, I appreciate it more for it's procedural nature and how it kind of takes us step by step through the process of setting up a big job like this - all the people that need to be involved as well as all the things that can go wrong. 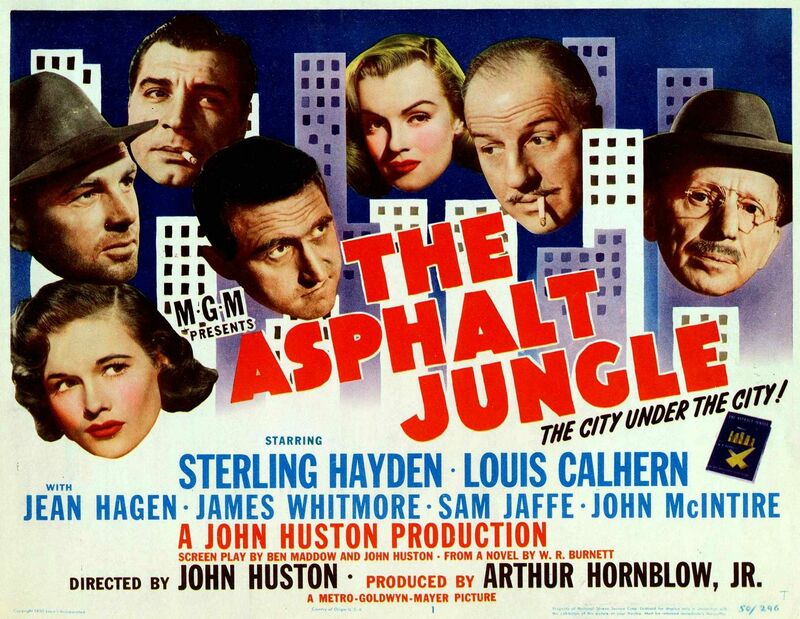 Another thing that THE ASPHALT JUNGLE does right is having the characters speak the "language of the streets". The tagline of the movie is, "The City Under the City! ", if that gives you a sense of what they were trying to do. All the grifter characters speak in that hard-boiled way that we all love film noirs to do, but it's also done in this case for more authenticity. It's really supposed to feel like we are hearing how underworld gents speak to each other. As you would expect, there is little explanation of what some of the slang means and we are left to infer from the context sometimes as to what these guys are talking about. So it's stylish dialogue, but with a purpose. The object is to make you feel like you've been given a peak into a secret world that you shouldn't be seeing if you're not unlawful yourself. In that way, the movie takes some conventions we've seen before and applies them to a much more docu-drama style context - which makes it all more effective. The whole thing is driven home by an excellent performance by Sterling Hayden, who was basically born to deliver dialogue like this and make it sound conversational. I must't forget to mention that this film also has an early performance from a young lady named Marilyn Monroe. Her part is not too big, but she is more than welcome anytime (she's also featured prominently in some of the promotional artwork for the movie). It also stars Louis Calhern, who I always remember from DUCK SOUP, where he is constantly being insulted by Groucho Marx. I should add that I love the trend of Criterion licensing Warner Brothers titles that's been going on for a little while now. The WB catalog is so thick with great films that it excites me to even ponder the possibilities of future releases. Here's hoping we see more classic Warner cinema come to Criterion Blu-ray in 2017!